This weekend, Rachel and I went to Austin, TX. It was a lovely town that reminded me very much of Portland. There were a lot of vintage shops and a lot of tattoos. We even got to see March Fourth, the Portland goth-freak marching band/sideshow act play along with Austin's own White Ghost Shivers at Antone's on 5th Street downtown. It was a hell of a show. Day to day, we ate some of the best food I've had in what seems like ages. Seeing the trailers for the special events at the Alamo Drafthouse made me wish I could attend their screenings all year round. Our time in Austin was a wonderful few days, over too soon. Also this weekend, Austin put on a "City-Wide Garage Sale" at the local convention center, which ended up being much more of a flea market or vintage bazaar in practice. There were a lot of tchotzkies and knick-knacks, jewelry, beads, old clothes and the like, but one booth in particular caught my attention: it was a seller of old magazine pages, from the earliest decades of the 20th century to the 70's. Full-page ads, illustrations, celebrity photos... and one section labeled "Bizarre." I came to it last and as I flipped through the selection I was presented with an array of shockingly morbid and sensational images, apparently clipped from Life magazine's Picture of the Week section in the 40's. One picture of the week was a still of a woman's body falling through the air in front of a New York storefront-- according to the caption, she'd been perched on a ledge eight stories above, threatening to jump, and the photographer snapped the photo only a second before she met the earth. Another jumper was a black man who had been interrupted in his suicide attempt at the edge of the Washington bridge. He was being held from falling by a police officer and a priest; the photograph showed him only a moment after he wrenched free, his face twisted in a grimace as he began his descent to the river below. Another was of an overturned semi truck, the cab set aflame; through a small mangled gap in the carriage a young man's pleading face could be seen. The caption read something like, "as the flames roar about him, a truck driver pinned inside his vehicle begs for onlookers to find a gun and shoot him." Another was of a drowned boy being carried from a river bank. 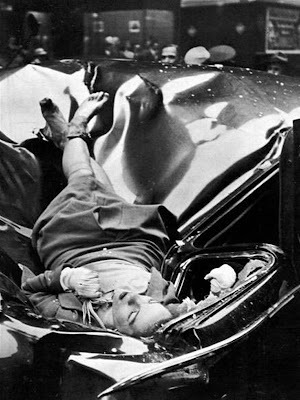 The small caption, inset onto the photo itself, reads, "AT THE BOTTOM OF EMPIRE STATE BUILDING THE BODY OF EVELYN McHALE REPOSES CALMLY IN GROTESQUE BIER HER FALLING BODY PUNCHED INTO THE TOP OF A CAR" An excerpt from the facing page elaborates: "On May Day, just after leaving her fiancé, 23-year-old Evelyn McHale wrote a note. 'He is much better off without me ... I wouldn't make a good wife for anybody,' ... Then she crossed it out. She went to the observation platform of the Empire State Building. Through the mist she gazed at the street, 86 floors below. Then she jumped. In her desperate determination she leaped clear of the setbacks and hit a United Nations limousine parked at the curb. Across the street photography student Robert Wiles heard an explosive crash. Just four minutes after Evelyn McHale's death Wiles got this picture of death's violence and its composure." I was instantly awed by the photo, transfixed. It's incredibly dramatic, and fraught with contradictions; I was amazed at how beautiful and elegant Evelyn looks, so peaceful, at rest. But of course the reminders of her state are unavoidable: the twisted metal and granulated glass that envelops her; the shoes lost and stockings tattered about her ankle; the way her hand grips her necklace, desperately, with a permanence. But her appearance is so delicate-- she's made up, with lipstick, and her dainty white gloves. There's no physical signs of bodily trauma, no blood, or limbs at tortured angles. Somehow it is an image of peace in a death where there should be none. All that afternoon and the next morning I was thinking of her. I had to return to the garage sale and buy it. I couldn't explain why, and I still don't know. For some reason I felt that I needed to take it with me. The image is powerful. Looking for an attachment for this post, I put her name into google. A grad student's homepage features the same image, and a story of the author being touched by the photo at a young age. She also shares that Evelyn was turned into Pop art by Warhol; the caption to Warhol's appropriation of the image reads much differently from both Life's and my own interpretation: "The repleated image of the body of a suicide, crumpled, twisted and almost unrecognisable within the near-abstract forms surround it, presents one more disturbing vision of disaster." This text, in my opinion, is utterly removed from the image itself, and what makes it so affecting. Evelyn is not crumpled, twisted, or unrecognizable; quite the opposite in fact is central to why her picture holds such power. She is whole, composed, graceful in death, almost as if not in death at all, but at rest, asleep, as the evidence of trauma billows around her, seemingly kept at bay by her own defiance of its chaos. In any case, it's clear that I'm not the only one who's been moved by this photo over the years, and a copy of it is now in my home. It was an odd purchase, one I can't necessarily rationalize-- I haven't got anything to do with this picture but keep it in a drawer. But it was something I couldn't leave in that box in Austin, for whatever reason. I wonder what Evelyn would think if she knew that people born 35 years after her death would be touched by the image of her final sad, defiant act. Hi, I found your page here for the very same reason. I was searching for more information about this woman and her circumstances after finding the photo in a copy of a sociology textbook about death and dying called "The Last Dance" 5th Edition. In any event, it is a very fascinating photo. Thank you for the information. I live in Austin and saw this image for the first time yesterday. I was stunned by the incongruity of a fall from such an incomprehensible height and the tranquility of the young woman's repose. A life that in death has moved so many surely had abundant potential. Hard not to wonder if she realized, once she became airborne, all that she might have been in life. I also found your page by searching for information about Evelyn. I found her photo in a book of various LIFE magazine photos, and was entranced to the point I had to sit down and write out what I was feeling. I left a link to your blog at the end! What Evelyn meant in her note and what we perceive in this photo of her death are two entirely different things. What is 'potential' and what is 'achievement' . . . In this photograph many are moved, as am I, and she has attained a form of 'immortality'. I'm sure this was not her intention, but her intents were to end the torments of her life. View the photo and see the vastness and variety of all existence. I am fifteen years old, and I was just doing research on the Empire State Building, and this photo came up on Google......I cannot tell you how amazing this is. When I look at Evelyn's composure, her grace, her utter sleep-like beauty, it entrances me. It gives one a new prospective on death. A death with no pain, but the death that you read about where your soul is instantly lifted to a better place, where peace is. Thank you so much Evelyn, and may you rest in peace. Hi, I also stumbled upon your blog because i was trying to know more about evelyn mchale. however, something else also intrigued me in this post. would you happen to know what issue of life magazine where the photograph of a truck engulfed in flames with the driver pinned inside was featured? I'd love to know more about it because it just seems so sad that the man was feeling so hopeless and wanted an easier way of dying. thanks in advance. re: The man in the truck: sorry, I don't know what issue it was. It was from the same era as Evelyn's photo though, probably within a few years. The photograph of Evelyn McHale, as well as several hundred other "News Pictures of the Year" can be found in a volume called "U.S. Camera, 1948" - "U.S. Camera was published every year for over a decade - for the other photographs mentioned in this blog, you might want to check all the issues of "U.S. Camera". If you can't find an online directory, copies of the books can still be found at Ebay and are relatively cheap. I can't help being fascinated by the act of jumping from a tall building to kill yourself. I'm not thinking now of something like the 9/11 jumpers, but rather those people who plan to jump and do it of their own volition. At that absolute instance when she'd thrown herself into the unforgiving void with death now rushing to meet her, I wonder what was Evelyn's mental state. She does indeed look for all the world like someone simply taking a nap. To do what she just did, and to wind up looking as though she'll be getting up before too long and going about her business...how on earth is that possible?? It's a photograph like no other that I've ever seen.